How scary was Alaska’s early spring? The first time I saw it, I chuckled. Although our town is often polarized on political issues, we all enjoy complaining about the weather. We all long for summer days that get above 55 degrees, and in February, we all dream of buying plane tickets to Hawaii. The bumper sticker was just another way of doing what we do best, joking about the not-always-hospitable climate in which we’ve chosen to live. But now it seems there is evidence that our wish for a warmer climate has been granted. Two nearly snowless winters back-to-back have prompted many cross-country skiers to exchange their skinny skis for fat-tire bikes, and the local ATV dealerships have started displaying four-wheelers instead of snow machines. In fact, 2014 and 2015 were two of the warmest years on record for Alaska. As if the fantastic summer of 2015 and mild winter that followed weren’t enough, spring in 2016 came a full six weeks earlier than it normally does. During the Memorial Day weekend, wildflowers bloomed everywhere. The snowline on the Kenai Mountains across the bay had already risen precipitously, and the kale in my garden has never grown higher. It seemed more like the Fourth of July than the end of May. I’ve spent 24 years in Alaska, and so this extra six weeks of summer feels something like winning the lottery or receiving a year-end bonus big enough to pay off the mortgage. I’m enjoying every minute of this newly extended summer. Arctic alpine forget-me-nots, in bloom. They're an early spring bloomer. But those extra degrees of warmth aren’t happening without serious consequences. Our recent warm winters have allowed spruce aphids, which previously were unknown on the Kenai Peninsula, to move into the area and thrive. All around town, the Sitka spruce trees that survived the bark beetle infestation of the 1990s are now turning red and dying before our eyes. The warm winters are also allowing for a resurgence of the spruce bark beetle, leaving us to wonder if our spruce forests are going to be around for the long haul. Spruce aphids and bark beetles aren’t the only unwelcome small life forms proliferating during these extra few weeks of early summer. The swarms of March flies, which aren’t normally seen in this part of the state, are harmless, but they certainly have been making a nuisance of themselves during the brief window of time between winter and full-blown mosquito season. There are other changes as well, shifts that go well beyond a couple of warm years and indicate an ecosystem that has been tipped out of balance. In the summer of 2015, local colonies of Alaska’s common murres failed to nest and reproduce, and in December and January, thousands of the dead seabirds washed up on beaches around South-central Alaska. Biologists have determined that the murres starved to death, but they still don’t know exactly why. Meanwhile, hundreds of sea otters around Kachemak Bay have died over the past year from a bacterial infection. And the wasting disease affecting sea stars along the Pacific Coast has now reached our waters, and it is causing the colorful echinoderms to die off in high numbers. Unfortunately, discussion of climate change, for whatever reason, has become susceptible to cliché. We’re tired of hearing about the problem, and we don’t know what to say about it that hasn’t already been said. That’s especially true here in Alaska. When we hear of retreating glaciers, threatened polar bears or the melting polar ice cap, our eyes glaze over. But now we really are on the cusp of something new and unexpected. As I sit on my porch looking over the garden I planted six weeks earlier than normal, with the sun on my skin and Kachemak Bay in the distance, everything seems fine. But on closer inspection, the signs of stress are impossible to ignore. I smiled when I first saw that tongue-in-cheek bumper sticker, but I’ve never taken the idea of climate change lightly. Still, I somehow believed its effects would be seen and felt more gradually. I suppose it was my own form of denial. All the years of charts, facts and numbers issuing dire warnings made sense to me on an intellectual level, but it took emaciated seabirds washing ashore and a dying spruce forest to make it real. 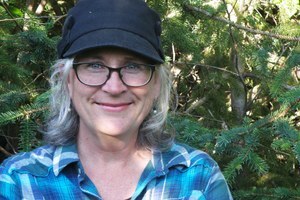 Teresa Sundmark is a contributor to Writers on the Range, the opinion service of High Country News. She works for the Homer Public Library and writes from Fritz Creek, Alaska.